vader is "father" in german. Father in German spells: V-a-t-e-r with a "T" in it. very, very, very sorry. my bad. word. did you get my pm? What an awesome thread. One of the most informative I've ever read. And what a Beautiful helmet. I agree definately a beautiful helmet. I would love to own something as stunning as this ! Not wanting to cloud up the found ANH Vader face mask thread I decided to continue the TM discussion here. And yes... Thomas, I had originally written that reply I posted in the TD thread in the screen used face mask thread, but decided to move it and settled on the TD thread, because I remembered you previously having the theory that the TD was made during ANH production and had an impact on the actual screen used helmet. It seemed fitting to put my comment in that thread, since it was relating to when the mold the TD came from couldn't have been made during the production. And I agree with Lambatour that the TD and the TM did not come from the same mold, but are definitely in the same mold lineage. Other than that we can agree and disagree on the details. About the eyebrows....they are not reworked on the cast itself. They are part of that casting. There is additional material fabricated to extend the interior of the eyes inside the mask....they are not added onto the TM original. 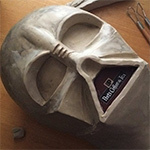 Therefore it is a copy of an original ESB mask which itself has been worked up that way. I have no doubts the dome is original, but the mask is a copy of an original and yes very likely a production copy given the dome is original (or?). As to why it is a copy at all of a reworked original ESB is open to question, because the original ESB hero and stunt masks don't show those reworked eyebrows. Well, having worked on several casts I can say that that eyebrow fix can easily have been made on the cast itself and you wouldn't be able to tell. That's the nice thing about resin, you can sand it all pretty. And you still wouldn't be able to tell whether the cast was sanded or whether it was cast that way. So I'm not buying that for one second, because there's no way you can make that claim. Secondly. The eye extension can also just have been done on the cast. And here's the thing. The probability that it is the filed down lenses is more plausible than something added. Having trimmed out the lenses on several face masks and also when working on my scaled project, depending on the orientation I file them down, I am able to make what looks exactly like the eye socket extensions when filing down from behind with the file out through to the front of the mask. Then afterwards I trim the excess inside the mask to have it be flush with the actual eye socket and where the lenses began. Two very different filing methods and one of them produces what we see as eye socket extensions. The TM then appears to have a groove added all around the eye socket between the socket and the filed down lens. You've shown pictures of your TD that had extra material in there and it shows the same thing - lenses filed down in that particular manner leaving excess material extending further back - however it does not have the groove like the TM does. But, that extra material proves it was cast with lenses that was then later removed. The detail makes no sense otherwise.